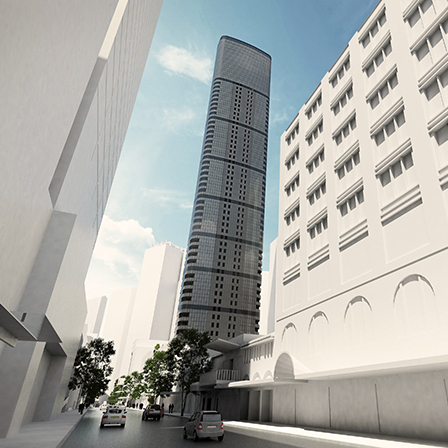 Brisbane’s skyline could soon be home to a new 60 storey apartment building at 195 and 199 Elizabeth Street in the CBD. Jensen Bowers’ team of town planners lodged the development application with Brisbane City Council last month. The planned residential tower, designed by leading architectural firm Rothelowman, includes 248 apartments and three storeys of commercial uses. A unique feature of the proposed tower is the inclusion of a mechanical car stacker which will automate the parking of 110 vehicles, a first of its kind for Brisbane. The development combines technological innovation with a world class design that celebrates Brisbane’s renowned subtropical climate. The podium design features undulating building layers that will be covered in leafy, sub-tropical vegetation. The approved building will revitalise the surrounding Elizabeth Street precinct. The Brisbane City Council is expected to make a decision within 6 months. Click here to view Jensen Bowers’ most recent projects. Do you need a Surveyor or Development Advisor for your next development? Call (07) 3319 4933 and speak with one of our experienced surveyors and town planners today about your requirements.